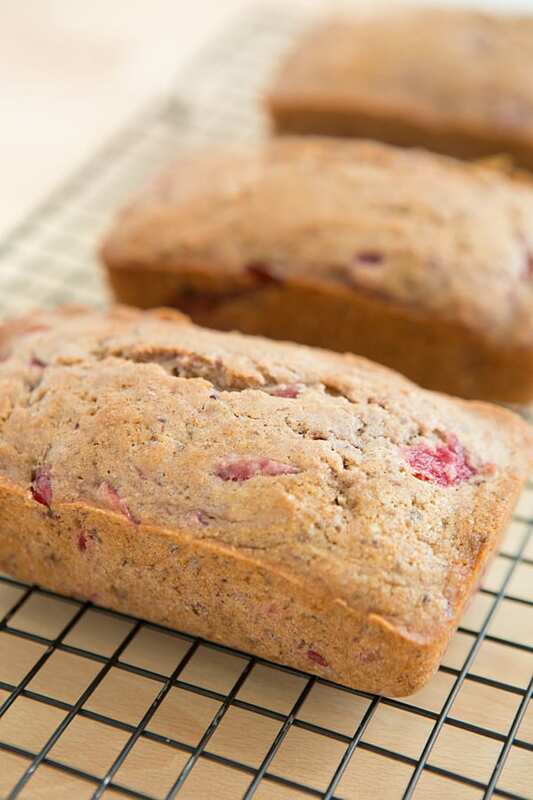 Leftover Cranberry Sauce Bread Recipe from Oh My Veggies! Back in the day, when I was all anti-establishment and down with the man, I would have never found myself partaking in Black Friday madness. But this year, I’m counting down the days to Black Friday because we need a new couch. Couches are expensive! Sales on couches are good! Do you know what four cats can do to a cheap couch in three years? Terrible things. Oh, the horror. (Cats: This is why we can’t have nice things.) So yes, I’m doing the Black Friday thing this year. 20-year-old me would want to kick 32-year-old me in the shin. One thing I won’t be doing the day after Thanksgiving is eating leftovers because, since it’s just the two of us for Thanksgiving this year, I decided not to make a big dinner. Sad, right?! Now that we live several states away, it seems silly to go home for Thanksgiving and then go back a month later for Christmas, so we’re opting for Christmas this year. But if you do happen to have Thanksgiving dinner leftovers, save some cranberry sauce to make this Leftover Cranberry Sauce Bread. Yes! You put the sauce in the bread! It has to be the chunky kind, not the jellied variety, of course. My mom went vegan earlier this year and over the summer, she sent me a bunch of her famous quick bread recipes so I could veganize them. I’m more of a cook than a baker, but I had fun figuring out how to take the dairy and eggs out of all of her recipes. I also managed to cut the sugar in most of them and add whole wheat flour too. I was pretty darn proud of myself and when I sent the recipes back to my mom, they all got her seal of approval. Which is a pretty big deal. This is a variation of my mom’s strawberry bread. I swapped out the strawberries for a cup of cranberry sauce and it works out perfectly. And if you still have leftover sauce after making the bread, you can serve it with a spoonful of cranberries on top. Ginger Orange Cranberry Sauce // The secret ingredient is ginger beer! Ginger Pear Cranberry Sauce // I made this last week (and it’s the sauce I used in this bread!) and it’s delicious. 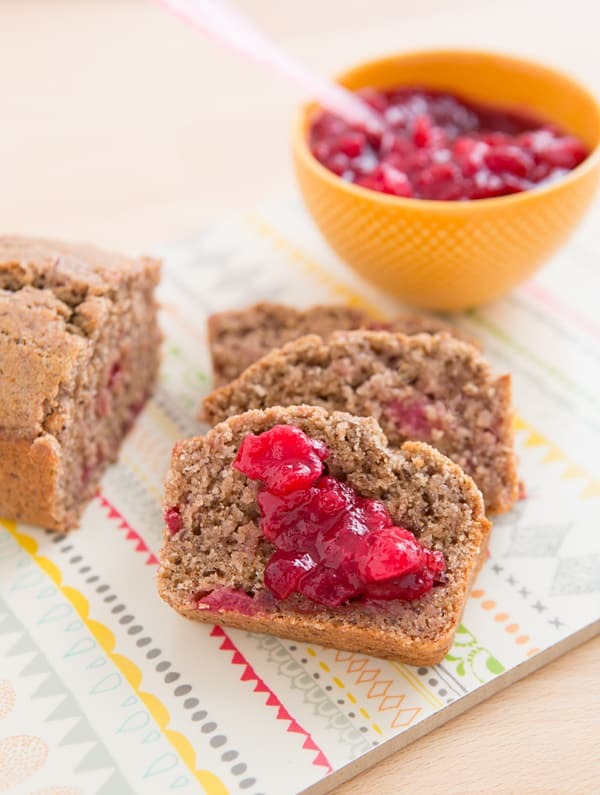 Use your leftover cranberry sauce to make this easy dairy-free quick bread! Combine the ground flax and water in a small bowl; set aside. Whisk the flours, cinnamon, baking soda, and salt in a medium mixing bowl. In another medium mixing bowl, whisk the coconut milk into the sugar until creamed. Slowly pour in the coconut oil, whisking to incorporate it into the sugar mixture. Stir in the flax mixture and vanilla extract, then pour the wet ingredients into the dry ingredients and stir until just combined. Fold in the cranberries. Use an oil mister to spray 3 mini loaf pans (3 x 5.75 inches) with oil or grease them with coconut oil. Divide the mixture into the 3 pans. Bake for 30-35 minutes, or until a toothpick inserted into the center of the bread comes out clean. Cool for 5 minutes, then remove the loaves from the bread pans and finish cooling on a rack. If your cranberry sauce has a lot of liquid in it, drain some of it off before adding it to the bread batter. I used this recipe for the sauce. I haven’t tested this particular bread recipe with a large loaf pan, but I have tested it with the strawberry version I’m adapting it from and a large loaf takes 45-60 minutes to bake.